Phosphorus combines with allthehalogens forming phosphorus halides which are all covalent compounds. Phosphorus chlorides are more important. Tri and pentachlorides of phosphorus are most common. 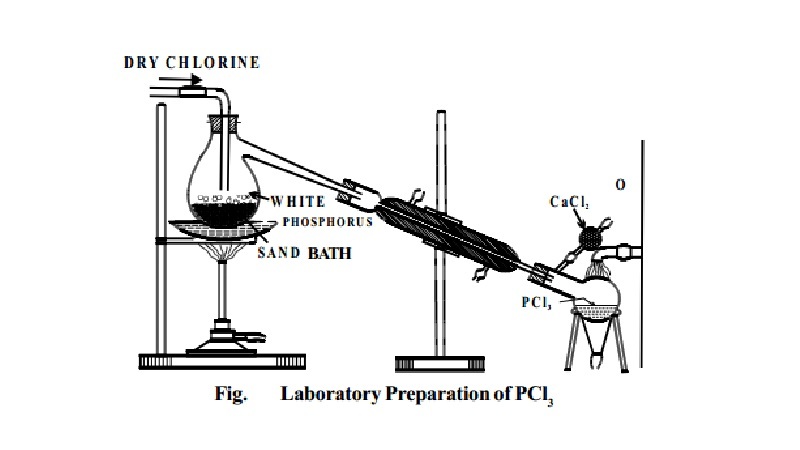 Preparation: PCl3 is prepared by heating white phosphorus in a current of dry chlorine. 3. It has pungent odour. group, such as acids and alcohols. 2.. It reacts with chlorine or sulphuryl chloride forming phosphorus pentachloride. hybridisation of phosphorus atom. One of the tetrahedral positions is occupied by a lone pair of electrons. excess of chlorine on phosphorus trichloride. 1. Phosphorus pentachloride is a yellowish white crystalline solid. 2. It sublimes on heating at 473 K and melts at 318 K under pressure. Phosphorus pentachloride dissociates on heating into phosphorus trichloride and chlorine. It is violently hydrolysed by water giving phosphorus oxychloride or phosphoric acid depending upon the quantity of water. PCl5 molecule has trigonal bipyramidal shape in vapour state which arises from sp3d hybridisation of phosphorus atom.